This pen is the Platinum/White Version. It is brand new, complete with box and papers. Founded in the 18th century, by the middle of the 19th century Faber had grown to become the largest manufacturer of wood-cased black-lead and colour pencils. Baron Lothar von Faber turned the humble pencil into the world’s first brand-name writing implement and created a series of fascinating products that remain classics to this day. When his granddaughter Baroness Ottilie von Faber married Count Alexander zu Castell-Rüdenhausen in 1898, the King of Bavaria gave his approval to the new name Faber-Castell. Our approach to our business, then and now, is based on an unerring awareness of quality, pioneering drive, and social commitment. 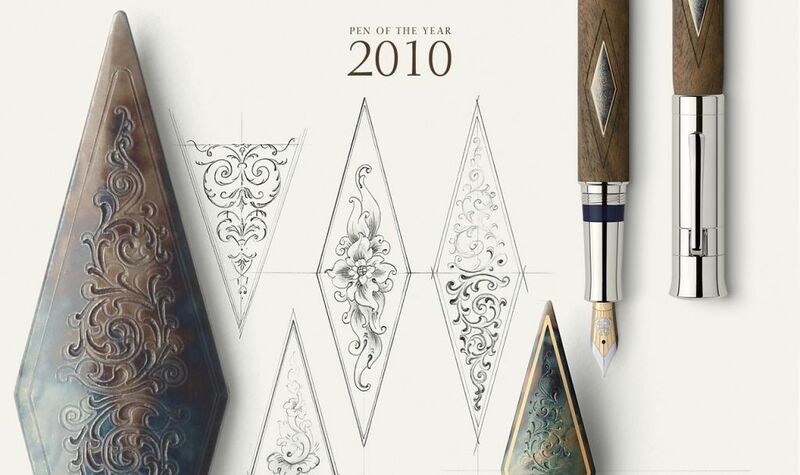 The Pen of the Year series began in 2003 and has established a firm place among connoisseurs of fine writing culture. These exclusive writing implements appear in limited editions and present unusual materials fashioned by hand with great skill. Each Pen of the Year tells a story of an epoch and people whose deeds made a strong impression on the history of mankind. This year it centres on an empire that, step by step from the 8th century BC, extended over three continents: Europe, Africa, and Asia. Even today, in the early 3rd millennium, it still exerts immeasurable influence on our world: the Imperium Romanum. According to legend, Rome was founded in the year 753 BC by Romulus, who had earlier been the subject of a remarkable drama: he and his twin brother Remus had been abandoned as infants but were discovered and suckled by a wolf. That was the start of a rise to fame without parallel in the ancient world. The city on the Tiber reached the zenith of its power in AD 117. Its vast field of influence extended from Scotland in the north to Nubia in Africa, from Portugal in the west to Mesopotamia in present-day Iraq. With its numerous peoples, the Roman empire embodied the idea of an “imperium sine fine”, a boundless empire, ruled from the “eternal city”. Rome’s symbol is the Colosseum: the legendary arena where the gladiators fought is an architectural wonder that has survived the changes and upheavals of the ages. Besides a rigid organizational structure, the main pillar of Rome’s power was the famous legions. The legionnaires were an elite corps selected only from the best, who stood up to all foes, even time itself: the legions lasted for nearly a thousand years. They were characterized by a special mentality. Legionnaires were no daredevil warriors but highly trained soldiers who stood their ground even in the toughest situation. They faced up to hordes of wild “barbarians” with uncompromising solidarity and discipline. If one of them fell in battle, another stepped forward and closed the gap. With this unflinching and selfless spirit they even succeeded in conquering Hannibal, a genius of strategy. Our image of ancient Rome is marked by emperors, gladiators, and legions. But the influence of the Roman empire is much deeper and more varied. Culture and the arts blossomed at that time, and the quality of life in Europe and North Africa was not achieved again for many centuries. Rome remains our example in other ways, too. The legal and political system in most European countries is based on the Roman model. Latin words are embedded in our languages, especially as scientific terms. And the Latin alphabet is used for written communication throughout the world. Typical Roman elements such as arches, columns, and domes are characteristic of many government buildings and grand houses. He was destined for great things from birth: coming from an ancient Roman patrician family, Gaius Julius Caesar held important office at an early age, conquered all of Gaul as far as the Rhine, and increasingly acquired the reputation of resolutely pursuing his goals. As no other, he knew how to follow up his deeds with memorable words. After the battle of Zela, when his legionnaires exhausted the troops of King Pharnaces II in just four hours, he wrote to a friend “veni vidi vici” – I came, I saw, I conquered. One need hear this concise triumphant phrase just once, and it is remembered for ever. The conversion of the Roman Republic into an Empire began with Caesar. He was the first ruler to be represented on Roman coins during his lifetime. In the struggle for the Egyptian throne, Caesar sided with Cleopatra, and a passionate love affair ensued. On her state visit to Rome, her luxurious banquets in Caesar’s villa caused quite a stir. The emperor had a golden statue of Cleopatra erected in the temple of Venus, where homage was paid to her as an incarnation of Isis, the Egyptian equivalent of Venus. Stone of the gods: that is how the Greeks expressed their respect for the beauty of marble. The Romans took up the theme: marble statues were reserved for gods and emperors. They were produced in large numbers to declare the power of Rome, and many can still be admired in museums. Marble of the highest quality from Carrara in Tuscany made a significant contribution to the radiance that commanded so much respect. It was laid down 30 million years ago when the African and European continental plates collided, pushing up the Alps. This choice stone allows skillful sculptors to create very lifelike statues. A unique aura surrounds ‘statuario’ marble from Carrara. Michelangelo used this extremely fine-grained gleaming white stone to create his monumental David, probably the best-known statue in the history of art. In the world of luxury, statuario stands for elegance and prestige to meet the most demanding standards. It forms an impressive sight in the entrance hall of the Faber-Castell castle, for example. For the ‘Imperium Romanum’ Pen of the Year 2018 we have chosen a special variety of statuario. Each individual pen is produced by hand with masterly skill in the Stephan jewel studios. Inserted between the marble segments of the barrel are platinum-plated rings decorated with laurel wreaths, symbolizing fame and success, and lending the pen its inimitable elegance. A further unusual detail in this edition is the elaborately worked cap with an engraving of the famous Colosseum and a miniature Roman penny (denarius). The denarius in the cap of this edition is modelled on a very rare silver coin from the year 44 BC depicting Caesar’s head. We found the original at Ritter in Düsseldorf, a prestigious dealer and certified coin expert. The radiance of the Black edition stands in fascinating contrast. In the search for a suitable opposite number to white statuario marble we made a lucky find in the Iberian peninsula, once part of the Roman empire. Nero Marquina from the Vizcaya (Biscay) region in the Basque country combines in a refined way a basic black colour with pronounced white veins. It harmonizes perfectly with the anthracite-grey titanium PVD coating that gives an ever-changing appearance in use. The fountain pen is fitted with a ruthenium-plated 18-carat gold nib, already run in by hand, which matches perfectly the very masculine appearance of the barrel. The cap of the “Black Edition” is also adorned by an engraving of the Colosseum and a miniature Roman penny (denarius). 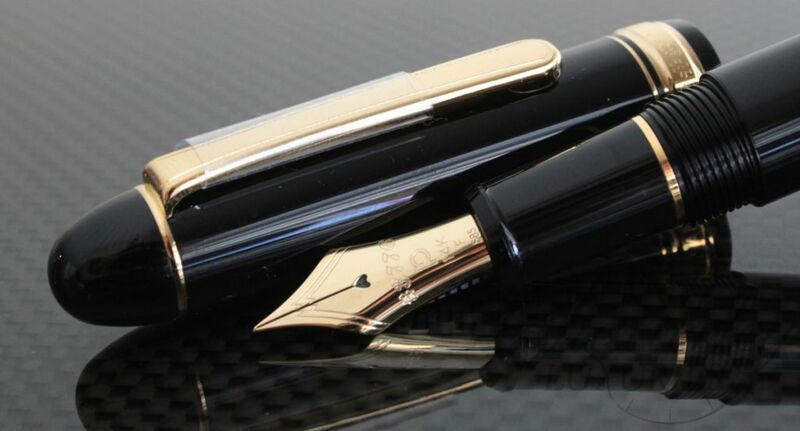 The platinum-plated fountain pen with its 18-carat gold nib is a limited edition of 400. Only 120 of the roller-ball pen are being made. The exclusive Black edition is limited to 330 fountain pens and 100 roller-ball pens. All are individually numbered and come in a highly polished black wooden case. A certificate bearing the signature of Count Charles von Faber-Castell attests that these are all strictly limited editions.